Book your stay « on our site »and benefit from the best prices ! The Deluxe is a modern room decorated with great taste. It is non-smoking and has an area of 15.7sqm (167 sq ft). It is equipped with all the necessary amenities for an excellent stay at Paris: Enjoy a flat screen TV with access to French channels as well as foreign one, a space in which you can work with your computer, an ensuite bathroom, and much more. 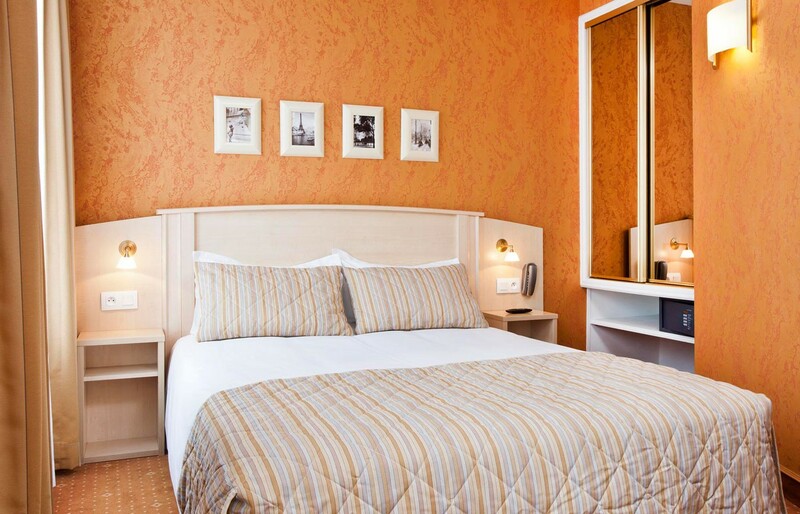 The Deluxe Twin at hotel Elysees Opera is a pleasant, well lit, non-smoking 15sqm (161 sqft) room in Paris. It is tastefully decorated in light tones that will soothe not only your eyes but also your mind. A cozy double bed is available for a peaceful night's sleep. Nice paintings representing Parisian street are hung on the wall, basking the room in an enchanting feel. 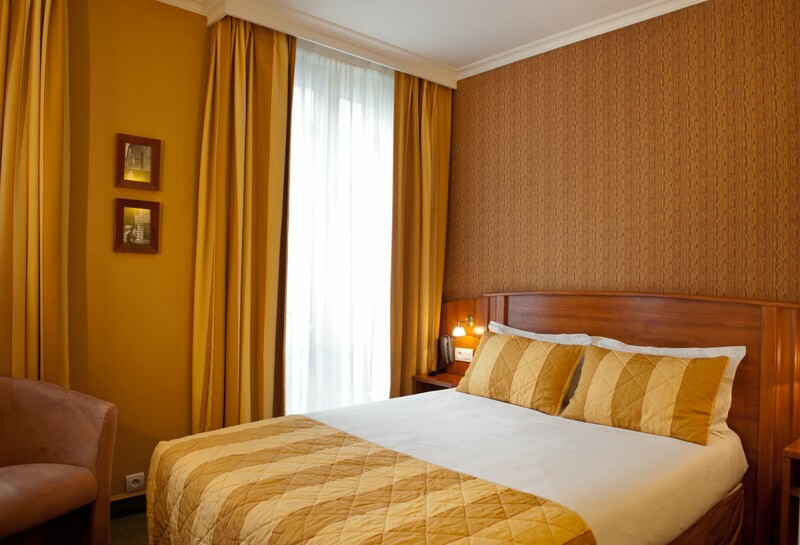 Book this charming non-smoking room of 13sqm (140 sqft), decorated elegantly in the shades of yellow mustard, and enjoya comfortable stay in Paris. Everything has been thought out, arranged and set to offer you a pleasant and memorable stay. From the quality of the furniture, mattresses and pillows to the two pretty little lamps on each side of the bedallowing you to enjoy your little reading session before falling asleep, everything is set to make you feel at home. The simple Eco is a very cozy, single, 9 m² (97sq ft) room that is also non-smoking. Decorated in warm, charming tones and furniture, giving it a very friendly atmosphere. Extremely practical, this budget-friendly room is equipped with all the necessary amenities to ensure you a pleasant stay in Paris, whether it’s for business or leisure : A phone, a spacious closet , a safe box to deposit money and precious objects, Wi-Fi access, and bathroom attached to the bedroom where you will find all the commodities you need. A refined decoration in warm tones gives this beautiful room of 12m ² (129 sqft) a warm and welcoming atmosphere. Non-smoking and perfectly arranged, by choosing the Double Standard rest assured that you will get to spend a pleasant stay during your trip to Paris. A bed for two, decorated with an elegant bedspread and comfortable pillows, will help you forget the fatigue of the day. 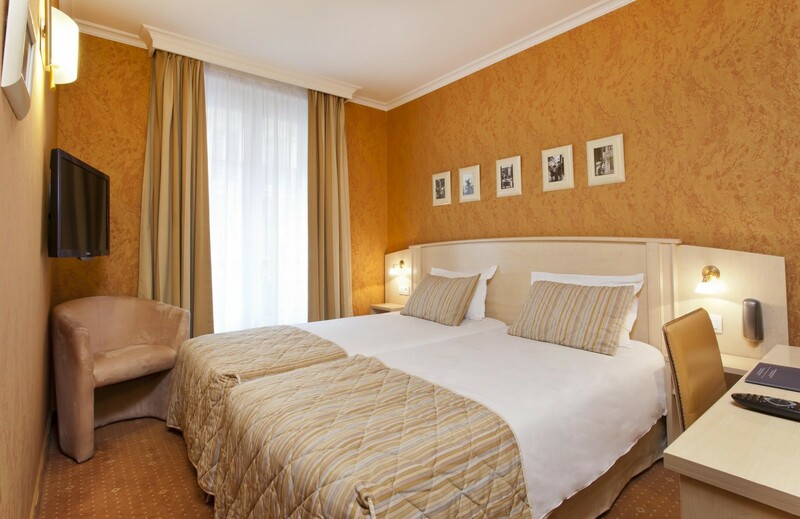 The Hotel Elysees Opera is a charming 3 star hotel located in the heart of 8 arrondissement of Paris.